This week, Denver's Planned Parenthood abortionist, Reid Goodman made national news. 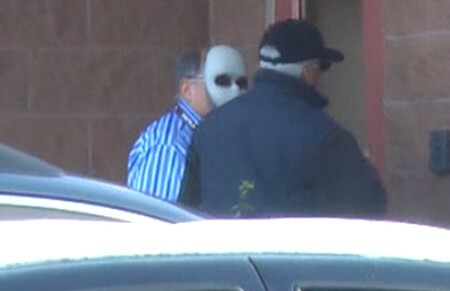 He's known locally for his unusual habit of wearing a ghoulish mask to hide his face as he drives to "work"presumably moonlighting for some extra cash. Since he has a respectable OB GYN practice, albeit one which also does abortions, at two locations in Denver, one would think he makes a comfortable living. In the words of Life Dynamics, "Abortionists are the bottom-feeders of the medical profession," which begs the question why? marauder and created an enlightening video with the Doc promoting his Mile High OB/GYN practice superimposed with footage of his alter ego ~ abortionist "Goodman" in a Jason mask. summoned the emergency vehicles, were unfruitful. "No 911 calls were made" was the explanation the caller received. A recent guest post by OR's Cheryl Sullinger at Jillstanek.com chronicles a rash of botched abortions ~ 10 in the past 20 months around the nation at Planned Parenthood clinics. Of course one prays that the ambulance at Denver's abortion mill wasn't for a botched abortion and that the individual who needed medical attention will recover. But the old cliche that abortion hurts women and kills children must never be forgotten. It seems the man behind the mask has forgotten how to live up to his name. The holocaust of his heritage has grown so dim, he can't see the parallels to his own life. May the disparate images in Tony Massey's "Goodman" video awaken in his spirit the desperate need to save his own soul. Pray he repents before he hurts even more than the numerous babies he kills daily. Repent, Goodman. Remove your mask and return to the babies you happily deliver into the arms of their awaiting mothers. Stop delivering others into the trash.